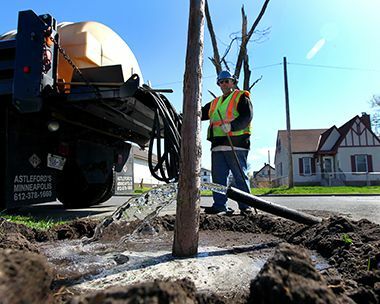 We are responsible for all City-owned trees, including boulevard trees, the public trees located between the curb and sidewalk in front of your home. We care for approximately 200,000 boulevard trees. We carefully consider the species and location of each public tree we plant. It will affect the area around it for many years and we want each tree to thrive. When we remove a boulevard tree, we add it to a replanting list unless something in the environment would prevent the tree from developing properly. 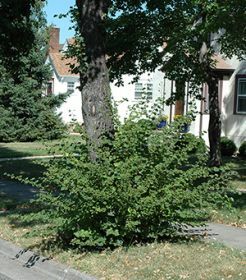 It is not necessary to request a boulevard tree replacement. We follow several placement guidelines when we plant trees to reduce future maintenance. Before we consider a location, we make sure it is an appropriate environment for the tree. We keep a list of potential tree species and choose their location based on their mature size. We plant trees that mature to the correct size for the boulevard to minimize interference with surrounding infrastructure such as curbs and sidewalks. We carefully select the tree species we plant under overhead wires. Our preference is to plant smaller trees to minimize interference. Alternatively, we may plant trees with a growth habit that allows for directional pruning, where we only prune the branches that grow toward utility lines or other obstructions. We try to plant trees at least 10 feet away from fire hydrants, driveways or utility poles. Care is taken to avoid interference with underground utilities. We also try to plant trees at least 30 feet away from stop signs, traffic signs, traffic signals, street lights or the inter division of curbs from crossing streets. We paint a white “T” on the curb to show approximately where we will plant the tree. We leave a hanger on your door with information about the planting. If you do not want us to plant a public tree on the boulevard in front of your home, call 612-313-7710 as soon as you see the white “T” painted on the curb or receive the door hanger. This gives us time to find a new location to plant the tree. If we already planted the tree, we ask that you accept it. Moving a planted tree is expensive and not good for the tree’s health. We are committed to maintaining a diverse population of trees. In residential areas, we typically plant two or more tree species on each street. Species diversity helps reduce the losses that may occur from a future insect or disease infestation. 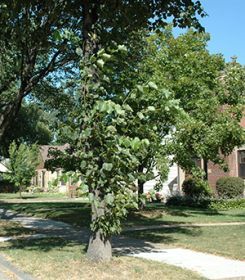 Following the devastating loss of American Elms due to Dutch Elm Disease in the 1970s, species diversity was achieved by planting one tree type on each block of a street. Following the discovery of Emerald Ash Borer in 2010, however, diversification was redefined to include two or more tree species on each block of a street. As a Minneapolis resident, property owner or public organization, you may request a permit to plant trees on boulevards, but you are responsible for the cost of planting. If sidewalk panels need to be removed in order to plant a tree, you will also need an approved Encroachment Permit from the Department of Public Works. Call 612-313-7710 or email forestry@minneapolisparks.org to request a permit. Because there may be publicity around boulevard tree planting events, you must include us in your event planning to ensure the trees are planted correctly. We will work with the contact listed on your permit request to determine our level of involvement, and we will outline event requirements in the permit. If you plant a tree without a permit on the boulevard in front of your home that is in a problematic location and/or is not an approved species, we will give you a deadline to remove the tree or replant it on private property. If you miss the deadline, we will remove or replant the tree. We routinely prune to keep our city beautiful and to maintain the health of our boulevard trees. It is best to prune sprouts growing from the base or trunk of a tree as soon as they appear in the spring when the growth is soft and you can remove it with your hand. Later in the year, the sprout becomes wood and you will need hand tools to remove it. Only use your hand or hand tools to prune a boulevard tree. Chainsaws are dangerous and could damage the tree. Cut the sprouts as close as you can to the trunk or base of the tree. Sprouts near the ground can get in the way of people walking and block the view of cars. Removing sprouts that grow from the trunk or base of trees improves tree health, appearance and neighborhood safety. If there is a tree on a boulevard that you think needs pruning, call 612-313-7710 or email forestry@minneapolisparks.org and we will decide if pruning is necessary. We pay to remove boulevard trees. The tree has Dutch Elm Disease and will remain marked for five days. After five days, we will remove the tree as soon as possible. We will remove the tree for another reason. For example, it is dead or dying. We make the final decision about boulevard tree removal, but will do our best to answer any questions you have. If there is a tree on a boulevard that you think we should remove, please contact us at 612-313-7710 or forestry@minneapolisparks.org and we will decide if removal is necessary. If your request is approved, you may have to pay for the tree removal and for the value of the tree. If we cannot plant the replacement tree in the same location, you may have to pay to replant the tree in a different location. We hire private companies to grind stumps because it is the most cost effective. Competitive bids are solicited from qualified contractors each year. The companies with the lowest prices are awarded a contract to grind a portion of as many as 8000+ stumps annually. The Forestry Department can spend over $500,000 annually on stump grinding. Contractors grind the stump below the surrounding soil or deeper if we need to plant a new tree in the same location. Stump grinding is performed according to strict specifications. The three main descriptions for stump grinding are shallow, regular or deep. “Shallow” grinds are about 4 inches deep and are mostly performed in parks. The majority of boulevard stumps are ground 8 inches deep which is a “regular” grind. “Deep” grinds are 18 inches deep and are performed when the new tree must be planted in exactly the same spot as the stump. 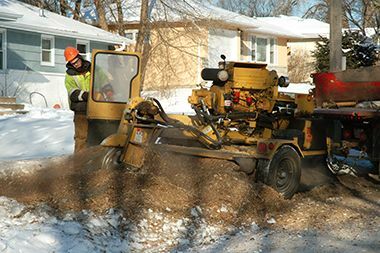 With all stump grinding on boulevards, the wood chips that are generated during the grinding process are picked up and hauled away for recycling. New topsoil is replaced in the hole. It is slightly mounded to allow for settling. We do not apply grass seed to the new soil area due to the seasonable variability of when grinding occurs. Propertry owners may reseed the boulevard if they choose to do so. Reseeding should not be done if a new tree is scheduled where a deep grind was performed. To know where a new tree will be planted, look for a white T on the curb. All boulevard stump grinding is dependent upon budgeted funds. 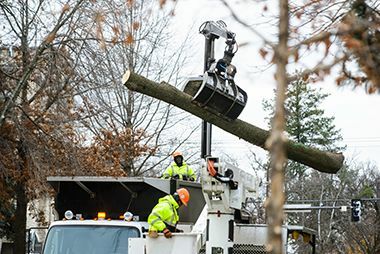 Because new stumps are generated throughout the calendar year, it is more efficient and cost effective to wait until annual tree removals are completed before assigning stumps to a contractor. For this reason, stumps are usually not removed until the year following the removal of the tree. While there are fewer deep grinds than regular grinds, there is no way to know from year to year what the exact count of each will be. To ensure that as many regular grinds as possible are completed, deep grinds are typically performed after regular grinds. If after completing regular grinds enough funds remain, deep grinds may begin in the fall. If completing regular grinds exhausts the budget, deep grinds will likely be completed in the late winter or early spring of the following year. Either way, this ensures that stumps requiring a deep grind are removed in preparation for the spring planting season. The budgeted funds available determine how many stumps we can grind and when. There are years when we may not have enough resources to grind every stump that is created. In these cases, such stumps will be completed using funding from the subsequent year’s budget appropriaton. Water newly planted trees thoroughly once a week during dry periods in the spring, summer and fall. This video demonstrates the best ways to water your tree. Does not have any weeds. Remove weeds with your hands, not with chemicals. Before you can add lights to public trees in a business area, you need to obtain an Encroachment Permit from the Department of Public Works. Then you must request a permit from us. Call 612-313-7710 or email forestry@minneapolisparks.org to make your request. If we approve your request to add lights to a tree, the lights must not harm the tree in any way. You may only attach signs to public trees if you do not pierce the bark. Do not use staples, pins, nails, screws or other fasteners that will damage the tree. If you pierce the bark, we may require you to pay for the damage to the tree.